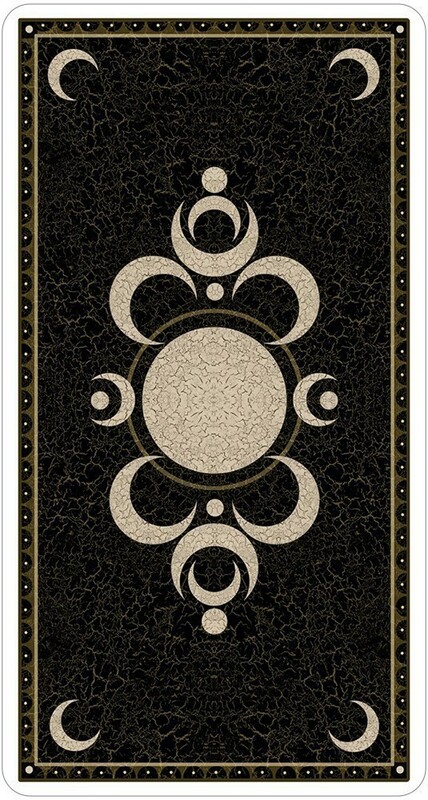 Cards measure 2.75" x 5.125"
I've seen hundreds of Tarot decks over the years, and I can honestly say there is nothing on the market that rivals the sumptuous textures, masterful artistry and utter originality of the Deviant Moon Tarot. 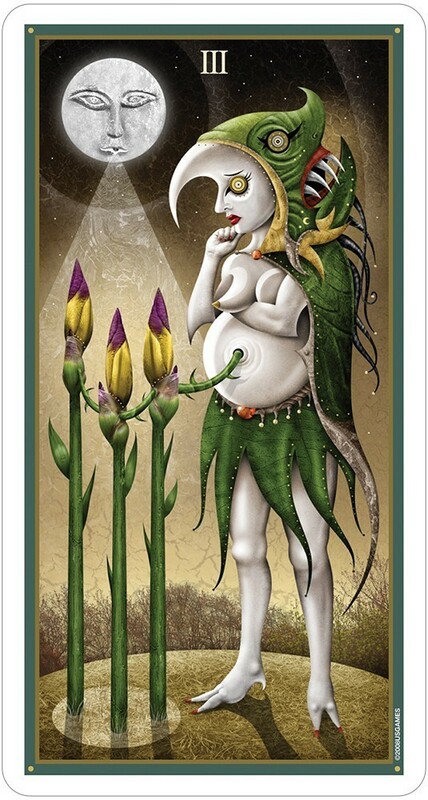 For months now, several images of the Deviant Moon Tarot were posted to the web, capturing the imagination of Tarot enthusiasts worldwide. Many were clamoring for news, more card images and a definitive release date with an almost desperate excitement. Tarot fans, rejoice! 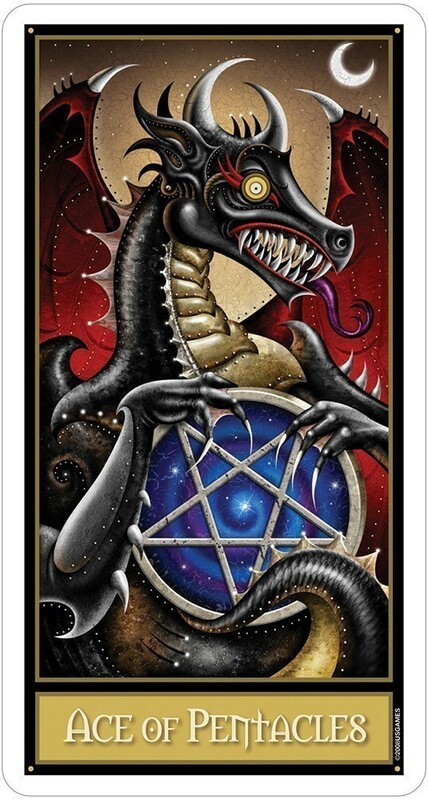 U.S. Games has now unleashed the highly anticipated Deviant Moon Tarot upon the world! And let me tell you, if the exquisite, highly-detailed online images whetted your appetite, the actual deck goes above and beyond expectation. The Deviant Moon Tarot expands on Rider-Waite imagery with a gloriously twisted perspective, reflecting common associations in dazzling patterns, striking colors, and surprising juxtapositions (e.g. a tree that bleeds red, a Page that has created himself out of spare parts and a sharp-dressed masked armless woman with a wheel for a left “foot"). The 9 of Cups, usually deemed the "Wish Card", aptly depicts a genie who's just emerged from a child's magic lamp. I’m pleased to report that not only is the Deviant Moon Tarot a solid reading deck, but also unexpectedly insightful. So despite the unusual characters populating the world of the Deviant Moon, they still speak messages relevant and purposeful to discerning individuals. This would make a great journaling deck, too, as well as one for comparative Tarot studies. Artistically, the cards are incredibly strong and equally consistent from the Fool all the way through to the King of Pentacles. They are dark on the surface and underneath; photographs from cemeteries and tombstones have been morphed and twisted into other elements of the cards: clothing trim, headgear and shoes. The backgrounds are urban and industrial, scenes are often set outdoors but there is little natural environment; the moon rises over smokestacks, dull and dirty skies, fortified buildings -- all created from photographs of a mental asylum. The figures in the cards are non-human, with layered faces and moon-like masks, wide staring eyes, bird-like feet and often elongated bodies. Despite the lack of regular human facial expressions and body language, the figures are remarkably expressive. It’s a deck of the subconscious, of bad dreams, of visions from a bad trip come to life. Patrick’s symbolism comes from childhood dreams and imagination, a visual dedication to his interest in the ‘more melancholy side of life’. It’s reminiscent of its Rider-Waite heritage but really has a feeling all of its own. It’s a nice change to see imagery with such polish and dedication that also has an obvious familiarity with the tarot’s symbolism; it stays true to tarot but brings to it a new and disturbing approach. The cards depart from traditional elements of symbolism in many ways but the card’s tarot meaning is still clear. 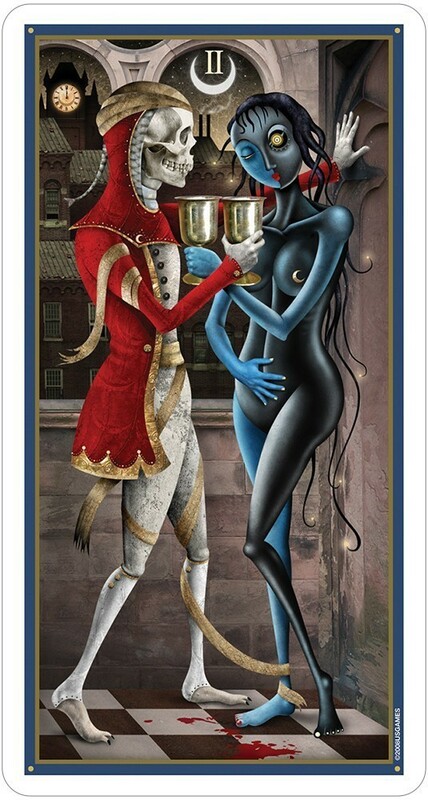 As in the Nine of Cups, the well-dressed character releases a genie from the bottle and looks on with surprise; a very appropriate image for what is traditionally known as the ‘Wish’ card. The King of Wand isn’t seated on a throne, and instead holds woodland creatures by the hand and strides through the scene, but still comes across as the confident, charismatic leader. 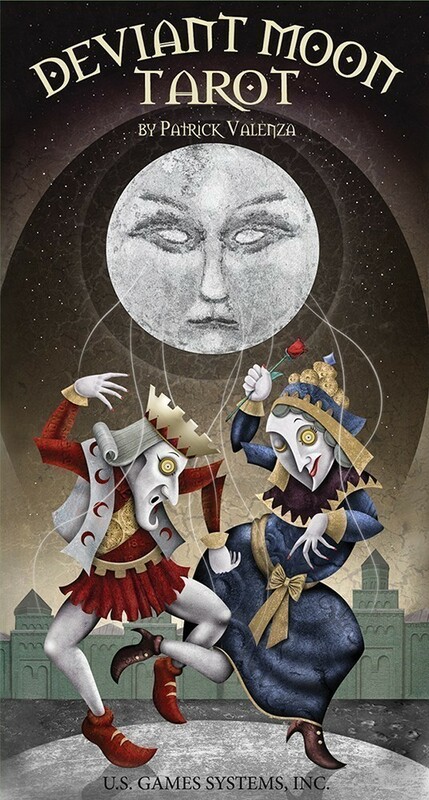 The Moon card is literally the puppet-master of the figures below, holding the strings that connect them and controlling their movements. Ugly but strangely elegant, Death has a red scarf wrapped around her skeletal horse head and a pregnant belly, signaling both the end and the beginning inherent in transformation of Death. The cards do have an uncomfortable edge, even in traditionally positive and usually pretty cards like the Star. The companion booklet is entirely in English and for each card shares a description of the imagery and a few keywords for the upright and reversed aspect of each card. Reading the booklet really not necessary to use the cards -- all of the depth is in the imagery itself, there is little further background or explanation needed. There’s an original ten-card spread as well, based on cards arranged simply in a circle. A little tarot knowledge is always useful, but it’s not mandatory to use the Deviant Moon. The dark and strange beauty of its imagery takes a new approach but is true enough to the tarot archetypes to be useable by readers from novice level to the well experienced -- as long as you’re prepared for a little excursion into the dark side of your subconscious. I received The Deviant Moon Tarot on a Monday and spent four days doing nothing but pursuing the cards. The images themselves are absorbing surrealistic humanoid figures in abstract settings, that are at once attractive and haunting. Many of the faces are 'split' between a light and dark half, some faces appear to be masked, and on others the masks are faces, some appendages have multiplied beyond the two that we’d see in a humanoid ... we expect to see some things, and we see what we expect ... and then are left unsettled as the images unfold. Patrick Valenza accomplished something quite unexpected, facilitated because he used a surrealistic approach to the Tarot. He has his static humanoids performing the dynamic actions that pertain to the card’s meaning. For most cards, it is a simple matter of 'what is this character obviously doing now' (or just completed, or about to do). Because of the organic and narrative approach to the subjects, we are also able to understand how each of the characters feels. The Tower is a tower, and the Devil is a devil (great feet), Temperance pours from one container to another, there are stars on The Star. However the images keep unfolding. There were little details that popped out during the readings, and I had to go to the source for some answers. "Uh Patrick, I notice there are a few oddly placed clocks with unexpected times displayed, for example in the Eight of Pentacles the clock displays eleven fifty-eight. ""Thanks for noticing" answered Patrick, with a wry smile, "Yup, two minutes to midnight ... all the work you do in a day, and there is always more to do the next. Day in and day out. Hoping for something to show after all of this work ... maybe you won't see it today, but maybe tomorrow. ""How about the Four of Pentacles, the clock there displays nine forty. "Patrick pauses and leans back. "There’s a background story here. My father-in-law was a greedy, materialistic man. Everything in his life was based on what he owned, and always put himself over his children. Well, the day came when he finally died. We heard the news at about 9:40 one morning. Nobody was particularly heart broken. I always wondered what he thought, lying there waiting to be cremated ... does he say to himself, 'I wish I spent more time with my children as they grew up', or was it, 'DAMN, I didn't make enough money!' So in this card, the death angel leads the miser to the fires of the furnace, with the symbol of time dangling from her mouth. The miser looks back on his possessions in fear that he will never see them again, while clutching a few golden pentacles in a last attempt to "take it with him".I ask "How about the Hanged Man. His clock says five eleven. ""I used to work at the most mundane job years ago ... a real nine to five. Many times, I would work a bit past the whistle. I found it a total waste of time, but back then I had little choice. I felt I was in limbo, and had to make a real effort to break free of my suspended life. This clock represents my lost time there and the times I worked past 5:00. "One last question Patrick, tell me about the borders ... ""The mixed colors come from the cards I created when I was 15. Truthfully, the colors on the majors just looked good with the color compositions of the individual cards at the time, so I just carried that over when I re-began the deck in 2004. However, the minors were different ... these colors relate to the citizens of each realm. The borders on the suit of Swords are Red for their strife and pain of the heart. Cups have Blue for the calm purity of the sea. In Wands I used Green for the earth and the natural world. And with Pentacles, Black for the materialistic void they have in their souls." So now that we have more information, we’ve also left the antiquated suit meanings in the past where they belong, in the latter half of the Victorian era. Even Majors refuse to pay homage to this era by using the Continental numbering system. This is a great deck for the reader who does not want to read a book and be told what meaning is. But I have to provide a strong caveat ... if you are a reader who prefers sunny bunny over truth -- don’t visit this deck. The Deviant Moon strikes to the heart of issues, with the same ease that it pushes aside six hundred years of Tarot myth-takes; it dives directly towards the truth. That will unsettle many. It’s often difficult to remember, that the voices that whisper in the darkness from the peeling walls, often speak the truth. The Deviant Moon Tarot is a Moon theme RWS based deck. The art appears very abstract, medieval and is inspired by ancient Greek art. It is a bit on the darker side, but I would not call this a dark deck. It actually appears to be a very workable deck. 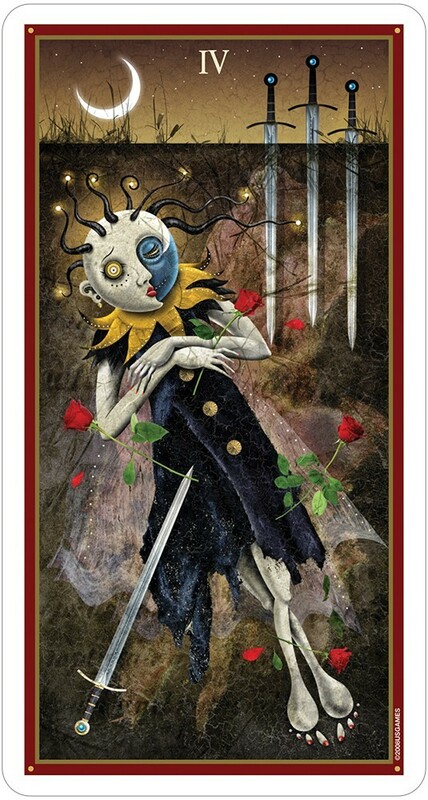 It will appeal to many, both Readers and Sitters This deck will be especially attractive to those who are fond of the non-traditional or maybe even looking for something a little creepy. The Little White Book included with this deck, gives meanings for the Majors and the Minors, in both upright and reversed positions. The spread in the back of the LWB is the Lunatic Spread, which is a ten card spread. It’s nice to see someone take some creativity with their LWB! Patrick Valenza created the Deviant Moon Tarot, basing it on childhood images and visions seen through his imagination and brought with him, into adulthood. His art ranges from detailed colored pencil and acrylic drawings to photographic manipulation that is used in combination with digital drawings, which was used to create this deck. Each card began with a drawing that was scanned into a computer, then they were manipulated. The background buildings were created with photographs that he took of a local abandoned insane asylum. I particularly like what is going on in the background of each card. There are many unique old-style buildings, which look like old factories, churches and abandoned buildings. There is a lot going on in each card. All of which can apply easily to your readings. For me the first impression of the artwork was startling. But as I began to flip through the cards the little characters began to grow on me. They are sort of gothic and whimsical at the same time and as I looked even closer I saw some interesting symbolism coming through as well. I loved how the characters on the cards had lunar faces- the bright half of the face, which I took as being the conscious self, has an open eye while the dark half, the possible subconscious of the face, has the eye closed. All the cards have titles except Death and the numbered cards. I found this interesting and mysterious it made me want to find out why. Then my almost 16 year old daughter came in the door and she fell in love with the images; they were just her style. She loves the whole Corpse Bride/Goth scene and this deck was made for her. She is also a budding photographer and loved the idea that the pictures in this deck are made from manipulated photographs. Then as I continued to flip through the cards I laughed out loud at the 10 of Swords. It’s the typical 10 of Swords image but the little creature is biting on his own hand while a little demon is biting on his shoulder. Somehow this scene just cracked me up. The cat made me laugh too just because it didn’t look very healthy (not that an unhealthy cat is humorous but you have to see this card to get my meaning.) I was starting to really like this little deck with its endearing dark little characters. Then I saw Patrick’s 6 of Cups and knew the Deviant Moon Tarot creator and I had found common ground. There was a puppet show the same idea I had for my MAAT Tarot 6 of Cups. In my opinion I think other people will come to find Deviant Moon to be a sweet little deck. Congratulations Patrick. I’m looking forward to shaking your hand at some Tarot event soon. When I was asked by US Games if I would be interested in receiving an advance review copy of Patrick Valenza's new Deviant Moon Tarot, I was very excited. I had seen a few scans of this deck in progress months earlier, and was quite interested in seeing the finished product. When I opened the deck, I was blown away. I had expected that after the first few cards, they would all begin to blend in together, just more of what I'd already seen. Card after card, I was surprised and delighted at every spectacular new image. I have never been more fascinated and impressed with a deck. A bit Dali, a bit Picasso, and a bit Cirque du Soleil, Valenza’s fascinatingly unique creation, the Deviant Moon Tarot, has an idiosyncratic beauty that is mesmerizing and compelling. There is an almost hyper-realism in the clean lines and the crisp colors and textures in the artwork, which presents a vivid contrast with the dreamlike surrealism of the scenes in these cards and the strange figures who cavort within them. 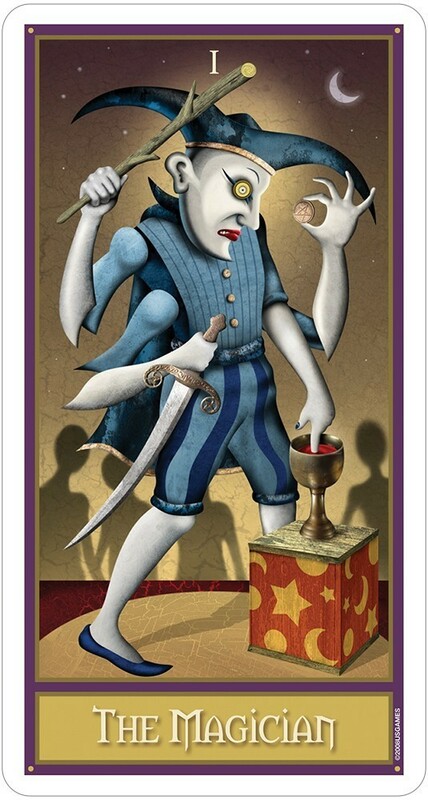 Indeed, the cards are populated with bizarre and grotesque characters that seem to have been inspired by a medieval bestiary or imagined by a child fearing what might be lurking under the bed at night. Valenza’s use of traditional Tarot symbolism on these cards is spare, but he has compensated for this by lavishing upon them whatever his imagination could dredge up from the depths of his subconscious. In this way, he has created a deck with a very creative take on the traditional Rider-Waite-Smith imagery. To say The Deviant Moon Tarot deck is just another deck in Rider Waite Smith tradition would be an understatement. The deck takes you into another world of ying/yang insectoid creatures populating a bleak industrial landscape. Patrick Valenza subliminally inserted images from cemataries and an abandonded insane asylum into the images. My first impression upon my receipt of the deck that it was too dark for me to do readings with for people I ordinarily would read for; but for those whose tastes lean to the unusual I'm sure it would work fine. The symbolism of the images maintains traditional interpretations in most cases, but give it a new twist. I think this is an excellent deck for collectors as well as those whose tastes and insights gravitate towards dark imaginings. 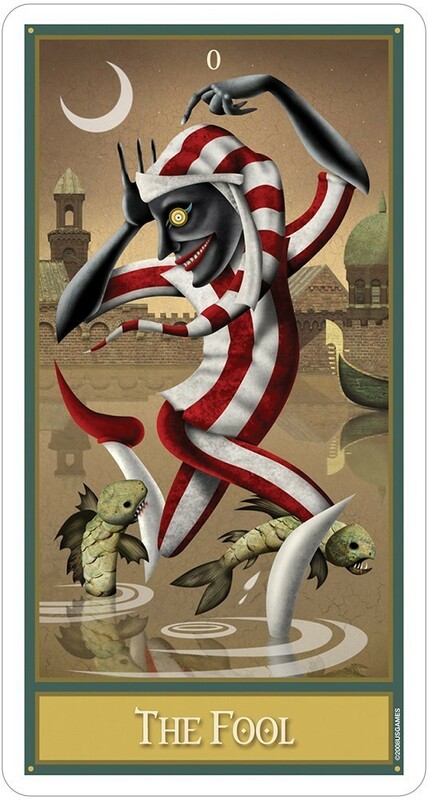 Valenza is a talented surrealist, and more than just in a deck of cards, the images belong in a museum as each are a unique work of art, making the old new again and reinterpreting it for our times. I have over 50 Tarot decks and this is the best symbology I have yet to see. I especially love the Death card with the pregnant mother and her having to exert some gentle force with her foot on the previous child to remind him that going back into the womb is not a possibility. It really gets to the nature of the Death card being permanent, can't go back, can only go forward change - change with or without our initiation. I love how most of the characters have more than one layer to their face - it invites you to ask, "How deep do you want to go?". The Lunatic Spread is great for getting to the meat of a matter and is an added bonus. The LWB is adequate but the real prize is the thought provoking scenarios on each of the cards. Well done!!!!!! I can’t say enough about how much I love this deck! The imagery is spectacular and just the feel that was needed in the tarot world. The deck is very high quality and the minor cards are wonderful. This is exactly the deck I have been waiting for! The Deviant Moon is a gorgeously alive deck. I thought just the artwork was appealing to me, but the more I work with these cards the more impressed I am. You can really sit down and have a conversation with the populace of this world, and they speak clearly. If you wonder at all about getting this deck, don't hesitate. Their world is not perfect, but they are not dark by any stretch of the imagination, and it is a deck that truly only requires reading the cards, no memorization, no confusion. The coating feels like satin, and the colors are amazing. I can't say enough good things about this deck, and I thank the creator, Patrick Valenza, most heartily! Valenza's highly stylized drawings are evocative, provocative, and fabulously unique. Each card is painstakingly illustrated but lacks the glitzy clutter of so many over-fluffed decks out there that lose themselves in dumbed-down beauty. This deck demands that you pay attention to the meaning of the card, not just how lovely the pictures are. As the author mentions in one of his interviews, there are no "filler" cards in this deck ... and it shows. So far, the readings I've done using these cards have been full of wry humor and straightforward truth. This deck has a crystal clear "personality" that refuses to compromise. Absolutely no fluff here, just an unabashed and incisive approach to "traditional" Tarot reading.